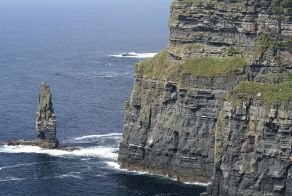 Sleep in and overnight in the city of culture and visit the Cliffs of Moher! 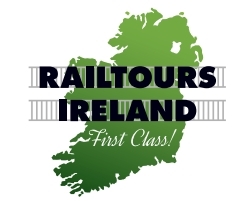 Check in for 3:25 pm departure from Heuston Station (please check in 20 minutes prior to departure). Arrive Limerick at 5:40 pm. Your evening is free to discover this lively city bubbling with beautiful Georgian architecture, grand museums and hang with the locals. Overnight Stay: Limerick. After the visit to Bunratty Castle and Folk park we make our way to Co. Clare. There is a lunch stop at O’ Connor’s Pub in Doolin before arriving at the Cliffs of Moher, among the highest sea cliffs in Europe. 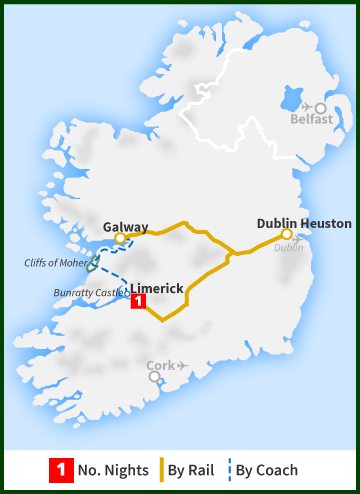 There is plenty of time to visit Ireland’s second most popular tourist attraction and your host will advise you of the departure time. From here we take the coast road for much of the way to Galway, with time for photos along The Burren. This is a national park and the word Burren comes from the Irish Language, it means ‘rocky place’. It is a unique lunar landscape of limestone which was described in 1649 by one of Oliver Cromwell’s men as: “No tree to hang a man, no water deep enough to drown him and no soil deep enough to bury him”. Today the Burren is noted for its diverse Flora with few parallels elsewhere in Ireland or indeed, Europe. We continue along the coast road to Black Head, passing the quaint coastal villages of Ballyvaughan and Kinvara before joining the main road to Galway. Free time in Galway for shopping or to grab a bite to eat before returning by train to Dublin.